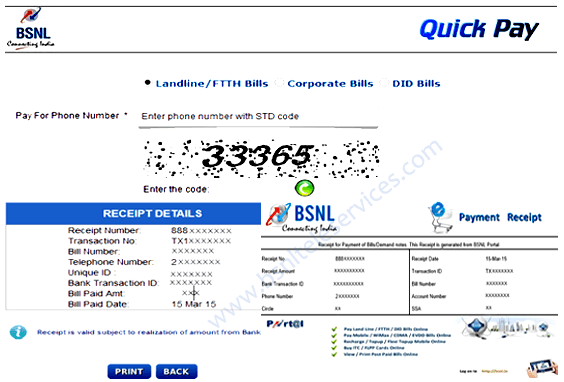 BSNL Bill Payment Online Service is called as BSNL Quick Pay. This brings out, most easiest and convenient way for all postpaid customers to make online payment in a secure way. This is available without any registration to pay BSNL landline bill, broadband bill, mobile bill through BSNL portal payment. With this smart online bsnl bill payment portal. Customers can instantly make their landline bill payment online without Login/Registration through BSNL Quick Pay. Where this bsnl portal payment details will be sent to the Mobile number instantly which provided. At the same time this online payment receipt details for your postpaid number will also be sent to the eMail id provided at the time of registration for Quick Pay BSNL bill payment portal. BSNL Customers, now allowed to pay all postpaid bills even after Pay By Date. It is through BSNL payment portal, Registered account on login, or improved BSNL Quick Pay option without registration. Subscribers can also be allowed to update their Mobile Number and Subscription for SMS Alerts. This facility is for, to get an SMS for each transaction made at BSNL payment portal. Telephone subscribers are easily be allowed to pay BSNL Landline bill (Individual), Broadband bill, FiberNet (Fibre to the Home) bill, Corporate Bills, DID Bills. It is just by submitting the Landline/Mobile Number, Email address, and Circle on BSNL Bill Payment Online(QUICKPAY) Portal. This is a hassle free and secured service with out any extra charges for postpaid bill payment online. Select Individual Bills / FTTH Bills, Corporate Bills, DID Bills as per your service. Enter Telephone number with STD code with out zero(4024XXXXXX) in Pay For Phone Number. Enter Valid Email address to receive paid receipts. Enter Mobile Number to receive paid transaction alert. Enter the captca code given. After Selecting the above payment option in Step1. Customer will be allowed to select the desired payment gateway with array of payment options for authorising BSNL bill payment. Then immediately, user can redirected to another page of Net banking / Debit / Credit card as per request for authorising the bill payments. After successful completion of BSNL portal payment. User is redirected to view the 'Digital RECEIPT DETAILS (Receipt Number, Transaction No, Bill Number, Bill Date, Unique ID, Telephone Number, Bank Transaction ID, Bill Paid Amount, Paid Date) for bill paid. Telecom Customers of all the Circles (Andhra Pradesh, Chennai, Karnataka, Kerala, Tamilnadu, Haryana, Punjab, UP(West), UP(East), Himachal Pradesh, Jammu and Kashmir, Maharashtra, Madhya Pradesh, Chattisgarh, Gujarat, Rajasthan, Kolkata, Orissa, Bihar, West Bengal, Adman Nicobar, Assam, Jharkhand, North East) can avail this BSNL bill payment online facility through secure bsnl payment portal for Landline, broadband, Fibernet, WiMax and bsnl mobile services. There is a possibility of link getting disconnected, during returning from the BANK after successful BSNL portal payment. In that case, user will not be able to see the 'Digital Receipt' of the BSNL bill payment made. Since the portal system will not know the details of the transaction made. If this occurs, PLEASE DO NOT ATTEMPT to pay the bill again. BSNL portal payment system will shortly receive the confirmation from the BANK, through alternative backup channel. And the receipt will be sent to user registered email id with in a short time. In case previous bills amount had already been paid and not updated in bsnl payment portal. Please visit nearest BSNL cash counter to pay the current bill amount, or else pay the total amount. Where the excess paid amount would be automatically adjusted in next coming BSNL Bill. If any complaints on landline bill or broadband bill or any transactions made through Quick Pay BSNL Bill Payment Portal. It is regarding your money debited from your bank account /credit / debit card and not generated the receipts. Please logon to complaint portal of BSNL and lodge your complaint regarding BSNL online payment. So that with in a short time, your paid details will be adjusted / updated or refunded to your account. This will be happened only, if you have done your BSNL bill payment online at Quick Pay BSNL payment portal. BSNL Broadband customers in many are searching about for a live bsnl portal to check bsnl usage and the process for, how to check BSNL broadband data usage in their account online or with an text based SMS services. To facilitate that for internet users, our ISP provides BSNL Selfcare portal to check data usage online at any time. Many BSNL broadband internet customers are worrying like this also. How much broadband data usage takes place in my number for this month as on date, when our free limit crossed and how much excess bills are coming for our internet data usage upto now, and what are the steps involved for online bsnl portal selfcare account to know and avoid unauthorized usage of my broadband connection?. It is always good for regular bsnl broadband data usage check, to know the usage pattern, By keeping this regular check on BSNL Broadband data usage, will helps the subscriber to ensure that nobody is abusing and making unauthorized use of broadband account also. For all these queries, Now there is no need to worry and for about excess broadband usage takes place in a particular period. To make a full stop for all these worries, our PSU comes out with two best options as follows for BSNL broadband data usage check on daily basis at any time in a simple way. Here is a fully illustrated process guide to check bsnl broadband internet usage in above mentioned two ways with below simple process. This bsnl selfcare portal requires the broadband user to be registered, this new portal provides broadband usage and landline customer details upto date and the facilities like Complaints, Broadband Plan Change, View Bills, BSNL Bill Payment, Check Broadband Unbilled Usage, Update Profile, Track Orders/Complaints Online, Change Broadband Password etc.., through login to their home circle respective link as follows. After registration into respective selfcare portal website, broadband internet customer can login to their BSNL Portal (BSNL Selfcare Account) with their own user id and password which was created, and follow this step by step process. then you will be opened with another page having date option, enter your dates here, immediately your BSNL Broadband Data Usage which is unbilled will be displayed with consumed bytes along Login and Logout time of the user. Step-1: Register land-line number by sending SMS "REG space Landline Number prefixed with STD code" to 52295 i.e. REG<space><STD code with Landline No> (Telephone Number means your Broadband Landline number) to 52295. Example: To register landline number 23455555 in Hyderabad, subscriber will send SMS as REG<space>04023455555 to 52295. Step-2: After obtaining SMS of sucessfully registration send SMS "BBU space Landline Number prefixed with STD code" to 52295 i.e. BBU<space><STD code with Landline No>(Landline No means your Broadband Landline number)to 52295 for obtaining Broadband data usage. Example: To know Broadband data usage of landline number 23455555 in Hyderabad, subscriber will send SMS as BBU<space>04023455555 to 52295. Step-1: Register Land-line number by sending SMS as "REG space Landline Number prefixed with STD code" to 919448077777 i.e.REG<space><STD code with Landline No>to 09448077777. REG<space>04023455555 to 09448077777.Step-2: After obtaining SMS of sucessfully registration send SMS as "BBU space Landline Number prefixed with STD code" to 09448077777 i.e. BBU<space><STD code with Landline No (Landline No means your Broadband Landline number) to 09448077777 for obtaining Broadband data usage. Example: To know Broadband data usage of land-line number 23455555 in Hyderabad , BB customer will send SMS as BBU<space>04023455555to 09448077777.with these above procedures, internet customers can check bsnl broadband data usage online at anytime from anywhere across the world on login to bsnl portal selfcare account and with simple SMS from India. Apart from this BSNL Broadband Data Usage Check Online at Selfcare Portal, ISP launches new BSNL Portal Websites with most required facilities to their internet customers with high speed easy navigation, having upto date options like Apply BSNL broadband connection online with Latest BSNL broadband plans, along with most used and required bsnl portal to pay the telephone bills on BSNL Online Bill Payment, which provides most convenient and secure access for bill payment with immediate updation into BSNL accounts. High Speed broadband internet users, who subscribes with Limited and Unlimited Volume based BSNL Internet Plans which are in FUP limit can helps to keep control on internet downloads and avoid excess bills for limited users by following this simple above illustrated process for BSNL broadband data usage check online with login to most advantageous selfcare BSNL Portal. Now-a-days we all feel technology is bringing people from distance places to near to us.. this is true but along with it, the fact is, we are unable to find time even for small activities, finding time for workouts or even to apply for New BSNL Broadband Connection, this is true - so that, we all expect some of these things to be Online with BSNL Portal or any, to get Best Broadband Connection at our door step with latest BSNL Internet Plans over ADSL and Fiber to Home Services along with BSNL Online Paymentfacility. Now registering for Landline or BSNL Broadband / FTTH in Online BSNL Portal is made very easy with new Online Application. So follow any ONE option with two simple modes as follows. BSNL Sales team will come to your DoorStep to collect documents and provide BSNL New Broadband Connection. Clink on the Respective BSNL Zone applicable with your circle. A new application window will be opened to enter your details. Select your Circle, Then your District, Feed the details like Name, Mobile Number, and Email, Land line number if exists. Select the service which you want to get ( BSNL Broadband, Landline, FiberNet(FTTH), ISDN, VPNoBB and Others) Apply Online, you can avail any BSNL service listed in the site. Give the address details clearly in capital letters with your District/Area Pincode to identify your area and assign concern person who can identity your location and also the Time Slot which is comfortable to you(if required). And Finally click Submit button and wait for a message and with in 48 hrs you will receive a call from BSNL to collect the documents for provision of new BSNL Services. LL+BB for New LANDLINE & BROADBAND Connection. So every/any customer can avail this easy facility to Apply Online for BSNL Broadband provided by our own PSU, for which is emerging to the heights, targeting for Good QoS(Quality of Services) and at understandable Customer Support for Best Broadband Services with Latest High Speed BSNL Internet Plans along with other services like BSNL Landline, Broadband, wireless device BSNL 3G Datacards and many more with BSNL Portal named UDAAN. BSNL Prepaid Broadband Plans for Limited and Unlimited Internet usage introduced by our telecom brand in 2012 with high speed bandwidth at more attractive and cheapest rates applicable for all Home and Business (Commercial) Broadband users. BSNL Broadband Prepaid Plans for Home and Business starts with a minimum broadband recharge amount of Rs 200(BBV RL 200)and maximum of Rs. 3000(BBV RL 3000) from 256 Kbps to 8Mbps high download speed accordingly which allows Prepaid Broadband Top Up facility also at any time. Installation charges and Modem charges for BSNL Prepaid Broadband Plans shall be collected in advance through Demand Note through the local commercial system at the time of application for Prepaid BB connection. In case of customer having his/her own modem, only Installation charges shall be collected in advance through Demand Note through the local commercial system at the time of application for new broadband connection with any BSNL Prepaid Broadband Plans. The creation of Prepaid Broadband account will be FREE of any charges (other than mentioned at A above) and the account will be created with complementary balance of 50 MB and with validity of 15 days from the date of creation. For limited plans, balance usage available if any will be carried forward, in case of recharge within the Grace Period *GP-1 (i.e. 15 days). Beyond 15 days (*GP-1), balance usage available if any will not be carried forward, but the customer can recharge his account upto another 45 days (** GP-2). After expiry of the additional grace period of 45 days (**GP-2), the account of the customer shall be deleted from the system. Top up vouchers of BSNL Prepaid Broadband Plans shall be available for additional data usage without any change in validity and Validity and Top Up Voucher shall not be applicable to those using unlimited usage. V. E-Mail ID On request by the customer, an email id with 5MB mail space shall be given in bsnl.in domain. The customer can recharge his account online from BSNL Portal after purchasing the voucher either through BSNL CSC or other retail outlets and view the procedure for Recharge. Internet customers of Home and Business who subscribes with any of the above BSNL Prepaid Broadband Plans can also have a superb choice to opt for BSNL Postpaid Broadband Services from all Rural and Urban areas on migration, by opting for cheapest BSNL Broadband Plans under postpaid services accordingly to their usage as per the convenience, by getting an option to check the broadband data usage with BSNL Data Usage check portal in daily basis upto date. BSNL facilitates their most valued customers with user friendly customer services, by allowing the existing BSNL Broadband Plan Change Online of existing to new, at any time on any device (Desktop/Laptop/Tablet/Smartphone etc..) with available login to BSNL Portal account in a simple way with all applicable New Internet Plans having Limited and Unlimited usage. BSNL Broadband Plan Change Online facility will gives major relief for most of the broadband customers, who haves no time due to their works for submitting a request for plan change at their concerned bsnl offices. This BSNL Broadband Plan Change Online facility will be available for all broadband customers of all BSNL circles across India, for that BSNL customer has just logon to respective selfcare portal as mentioned below of their concerned zone and register as new user at BSNL Portal by filling the details(not required for already register user). http://selfcare.sdc.bsnl.co.in for BSNL South Zone (Andhra Pradesh, Chennai, Karnataka, Kerala, Tamilnadu) customers. http://selfcare.ndc.bsnl.co.in for BSNL North Zone (Haryana, Punjab, UP(West), UP(East), Himachal Pradesh, Rajasthan, Jammu & Kashmir) customers. http://selfcare.wdc.bsnl.co.in for BSNL West Zone (Maharashtra, Madhya Pradesh, Chattishgarh, Gujarat ) customers. http://selfcare.edc.bsnl.co.in for BSNL East Zone (Kolkata, Orissa, Bihar, West Bengal, Andaman Nicobar, Assam, Jharkhand, North East ) customers. After registration into Selfcare portal, BSNL Broadband user has to sign in using with registered user name and password, then do the following simple steps for plan migration with new benefits. Select your Service Id from drop down menu display, after selecting Service ID, a small new window with Landline & Account No will open, Click OK to confirm, then the address details will be displayed. Select Request Type as Change of Broadband Plan, then your existing broadband plan details will be displayed. Select New Broadband Plan with your required plan from all the plans displayed at the right side dropdown menu. After giving relevant data, click on Submit. After completion of these 4 steps,then you will a service request number. On next working day, BSNL official will contact you over mobile phone number, which you have already provided, for confirmation about your BSNL Broadband Plan change, then after your confirmation, your plan change will gets completed to enjoy the new plan benefits. New deposits/charges if any, according with new plans, will be charged in next coming telephone bill, so that, you can pay this with Online Bill Payment or directly at BSNL cash counters. Subscribers can change their existing plans to new required BSNL Broadband Plans from any where in the world through web via BSNL Selfcare Portal at any time with out any tension for BSNL broadband plan change online with required BSNL internet plans. India’s largest broadband subscriber base ISP offers BSNL Latest Broadband Plans 2016 in mesmeric type on Landline and Fiber Network, suits each and every need for Home and Business Internet, which are quite captivating for the customers across India. PSU offers these BSNL Latest Broadband Plans at Cheapest Tariff Rates under Prepaid and Postpaid Internet Services by enabling all customers to apply online at BSNL portal for new broadband connection to home or any business. Telecom major presents cost bearable BSNL latest broadband plans towards rendering advanced internet technology to its subscribers with Free Landline connection in India. BSNL also offering varieties of internet plans under Prepaid and Postpaid services, to provide Limited / Unlimited Internet for both purposes of Home (household) and Business (Office) subscribers. BSNL is having huge variety of advanced technology commodities and internet resources which are very much appealing and satisfactory in Rural and Urban areas. To provide all services at an affordable cost with cheapest rates to a customer, ISP offers best rated BSNL Broadband Plans and Modems for subscription. Telecom major offers Best BSNL Broadband Plans with super fast download speed to subscribers for Home and Business with the below mentioned internet packages comprise of bandwidth speed atleast 1Mbps and utmost 24Mbps in DSL technology and upto 100Mbps through Fibernet. Where subscribers can select whatsoever plan fitting their requisite and accords with the usage of internet data by subscribing. BSNL also facilitates two choices in obtaining BSNL broadband data usage on regular basis. It is constantly desirable to incessantly affirm the broadband data usage account to keep in track of usage structure. This in turn assists the customer to hold assurance on internet downloads and uploads when subscribed to a BSNL Limited based Volume grounded Broadband Plans and control on unlimited usage to avoid FUP limit cross. How to check BSNL broadband data usage ? BSNL Internet required Customers on Landline and Fiber Network, can now apply broadband at BSNL Portal or by approaching concerned area Customer Service Center for availing super fast broadband services with any above BSNL latest broadband plans for home and business applicable for all Rural and Urban areas with Free Landline connection having unlimited free night calling. BSNL customers will also facilitates to pay the BSNL bills online to avoid rush to counters for payment of BSNL broadband bills with hassle free transactions on secure mechanism. So lets join together and subscribe for BSNL latest broadband plans to avail ultra speed internet facility with minimum of 1Mbps at best prices never given and be a part in national growth. BSNL Broadband Plans, the reliable tariff offered by high-speed internet access service provider with unlimited internet for home and business. Public Sector Undertaking provides this broadband schemes at cheapest fixed monthly charges by providing free BSNL landline connection. ISP introduces these particular plans with high-speed internet connectivity from 1 Mbps to 24 Mbps download speed (bandwidth). So that the customer has a choice to choose the best BSNL broadband plan. PSU allows more free calls in each internet plan for every Rural and Urban area customers across India. Also allows all BSNL broadband plans customer with most required online bill payment facility along with unlimited free calling. The voice of customer about BSNL broadband is, "BSNL the best internet for every home/business at anywhere in India". This broadband unlimited home plans and business tariff are "More Pocket-Friendly Plans" at most reduced prices in our country. India's number one internet service provider offers upgraded bandwidth in each of unlimited internet BSNL broadband plans like BBG UL 545, BBG Combo UL 675, BBG ULD 795, BBG Combo ULD 845, BBG Combo ULD 945, BBG Combo ULD 999. Also BBG ULD1275, BBG Combo ULD 1441, 1445, 1495, 2091, 2799 and BBG ULD 1891 for all including commercial customers by allowing free static IP in some plans. Telecom giant offers unlimited internet through landline telephone copper network with free calls to the customers under ADSL services. These provided BSNL broadband plans are plentiful and attractive at an affordable monthly budget. ISP allows standard and combo BSNL internet plans, having unlimited uploads/downloads for every home and business user. The below mentioned cheapest high-speed internet packs are the standard BSNL Broadband Plans in 2016. These postpaid BSNL broadband plans are available at the lowest price for WiFi /normal internet connection to all customers of Andaman Nicobar, Andhra Pradesh, Assam, Bangalore, Bihar, Chhattisgarh, Gujarat, Haryana, HP, Jammu Kashmir, Jharkhand, Karnataka, Kerala, Kolkata, MP, Maharashtra, Pune, N.E. I and II, Odisha, Punjab, Rajasthan, Tamil Nadu, Telangana, UP East West, Uttaranchal and West Bengal with reliable BSNL WiFi modems at best price and with cash back offers now available in the market. However, the rental charges for BSNL broadband plans in AP / Telangana, Odisha, Madhya Pradesh, Maharashtra, Gujarat, Bijnore of UP West and Tamil Nadu circles will differ along with new speeds for some of these schemes. Existing customers also facilitate for BSNL broadband plans change online to any other plan for reliable internet in this 2016. The new online system will ease the client to avail any unlimited internet plans 2016 through online only. Mentioned BSNL broadband plans monthly rental fees are exclusive of service tax, Which should be as per prevailing tariff rates. Security deposit for Local/STD/ISD facility and BSNL installation charges are applicable and charged for the customer through BSNL Bill. The major thing is, PSU now allows all these schemes through Fibre to Home also, if technically feasible. Where this tariff is not applicable for BSNL broadband prepaid plans. So have a look at the excellent BSNL broadband plans tariff as below and enjoy unlimited free call. Presently this free calling is available to any network landline and mobile in India from 9 PM to 7 AM on all weekdays, and during 24 hours (day and night) on Sundays. ULD stands for unlimited internet with differential speed. DL = Download, UL = Upload. MCU = Meter Call Unit. FMC = Fixed Monthly Charges and Land/Fixed Line Plan = BSNL Landline Plan Urban or Rural (whichever applicable). In these unlimited BSNL broadband plans, all telephone calls charged at Rs.1 per MCU for the own network after free. For all other networks, it is 1.2 rupee per MCU. In NCR SSAs (only in Faridabad, Ghaziabad, Gurgaon, and Noida), available free calls under combo tariff offered as 50% calls within own network and 50% for other n/w from 01.04.2013. BSNL broadband plans customer was also allowed to pay their internet bills through BSNL bill payment portal on login with registration or BSNL quick bill pay without registration. It is the easiest, secure and convenient way for payment of BSNL bills for landline(bb), FTTH, and WiMax Connections. Internet required customers in many from various circles across India thinks about, how to apply for BSNL broadband service online. It is either for ADSL or Fibre to Home unlimited internet connection. It should be without going to an office. For this, PSU comes with a new innovative idea. Facilitates the customers to apply BSNL broadband directly online. It is also from any registered BSNL Portal account with this new home or business unlimited internet BSNL broadband plans. We all know BSNL Broadband provides truly unlimited plans all over India. Many of the broadband users are thinking that, Can our ISP increased BSNL Speed Limit or not to overcome the specified FUP condition which gets finished on the starting days itself and thereafter with reduced speed. Making a full stop for these type of slow broadband services, BSNL now upgraded each and every all India unlimited broadband plan with high BSNL speed limit and upgraded FUP speed after the limit crossed as a permanent measure. Internet is every where, requirement of internet for official purpose, for entertainment, for education, for shopping, for health services and also going nearer to the farmers also. Internet usage limitation ends if our creative usage ends. If you consider class room sessions when we have graduated, we analyzed from the book only, but nowadays kids are having wide scope of opportunities for learning, but everything works on internet. In consideration with all these, and in support for Digital India, BSNL now upgraded all unlimited combo internet plans. Increased BSNL speed limit upto 100% in some plans and increased the existing FUP speed upto 1Mbps in all combo unlimited internet plansfrom 512Kbps after consuming data from FUP limit. This will really make its existing subscribers to happily do their activities at any time having the following upgraded tariff. In all BSNL broadband plans other than above, the speed after FUP limit is increased to 1Mbps. Along with the above up gradation of download speed and BSNL speed limit in all unlimited broadband tariff plans. BSNL has withdrawn some of the under performed existing broadband plans as mentioned below for new subscriptions. To acquire more number of New broadband customers into BSNL umbrella and for retention of existing customers. ISP upgraded the BSNL Speed limit and after FUP speed as above. So new customers join with BSNL, enjoy high speed internet with out any broadband topups. Those who compares BSNL services with other ISP, will have no chance now, because BSNL the only ISP provides better speed and service with same or less charges than all others in India. No one in India can beat BSNL broadband. So internet users, It’s now the real time for you to subscribe for upgraded internet services effective from 1st August 2016 to enjoy the highest BSNL speed limit in each plan.